My brother lives in Addis Ababa. This means I sometimes get cool stuff (like coffee straight from the highlands) and sometimes rather incomprehensible parcels in the mail. 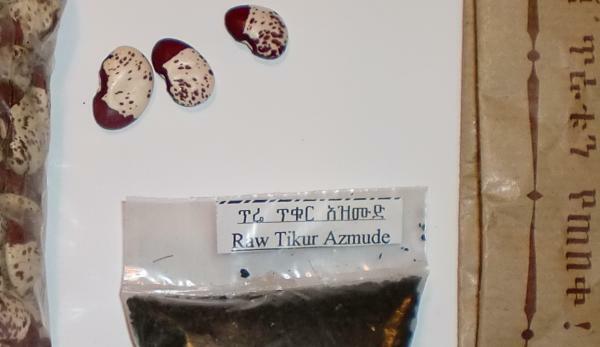 In this case, I have a sachet of "Raw Tikur Azmude" and a bag of very interestingly colored beans. See photo. Since my Amharic just isn’t what it needs to be — and I still have Hausa on the list of things to do above learning Amharic — I’m at a loss as to what to do with this. So anyone with some Ethiopian cooking hints, please drop me a note. Even if Talk Like a Pirate Day (developer idea: implement tlapd, a proxy LDAP server that mangles replies to be more piratey or which intercepts http requests) passed quiety for me this year, I’m still partial to the (ahem) romantic ideals of the pirate. So when Something Positive pointed to a Steve Jackson floortop game Evil Stevie’s Pirate Game which combines Pirates, Lego ships and large group gaming. Whee! Recent kitchen projects have included a totally failed meringue pie and chocolate ice cream — neither of which the kids liked, but which nonetheless disappeared so quickly no photos are available. And I think I’m getting the hang of white bread now, too. Need to work on getting the crust just right. GUUG’s Linux Kongress is on right now, if you’re near Nuremberg. NLUUG’s Fall Conference, with Security and Privacy as topics, is coming up at the beginning of November. Lastly, I’m happy to hear tales of people (like Frederik) Joining the Game. Coincidence that he describes what KDE e.V. does the same day I write a rather dry item on the same topic? Mystery! At least he can spell “e.V.” properly, which I couldn’t. Mushroom risotto:heat some olive oil and sweat off an onion until glazed; stir in some chopped mushrooms and allow them to brown. In the meantime, prepare 2 cups of mushroom stock (from bouillon cubes if you like, and the Polish ones do taste better than the Dutch ones). Add one cup of rice and toast it for three minutes, stirring occasionally. Quench with one cup white wine, then stir in the stock, half a cup at a time, and allow the rice to cook (about 16 minutes at lower heat). Salmon: 400g salmon fillet. Rub down with salt and pepper, allow to stand 15 minutes. Melt butter (actually, I tend to use half butter half olive oil for frying fish) until browned, then add fish (I don’t have a pan that will take a single chunk of fish this large, so I cut it in two and have to shuffle a little). Fry one side 3 minutes, sprinkle dill liberally on upper side, then turn over, fry for another three minutes. Add one pound chopped beet greens over top, splash on some wine and cover tightly to steam the greens for 4 minutes or so (until the fish is just done). Serve with what’s left of the wine — if the cook has been tippling in the kitchen, don’t give him any more. A selection of cheeses makes a fine dessert. Some folks know that I used to be a fan of the Gallery of Regrettable Food — also a source of recipes to avoid and wonderful pictures. 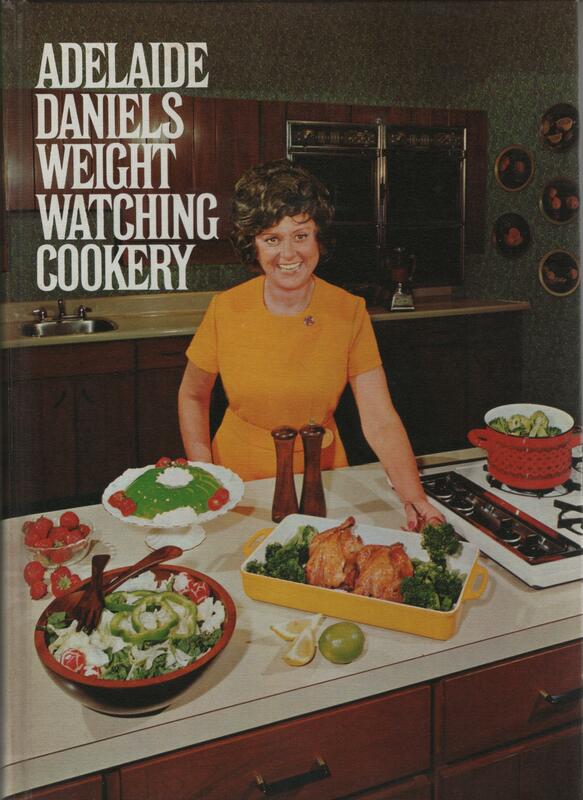 So while re-organizing my house and clearing out shelves, I found a wonderful item: Adelaide Daniels Weight Watching Cooking. The food itself is so-so, typical early ’70s Canadian fare with plenty of evaporated milk and instant coffee and the inside illustrations are just boring. But the cover! So in the interest (questionable, I know) of saving the cover and pitching out the paper (to the recycle bin), I’ve scanned it. Click for full(er) size, 850kB; the scan is a little less vibrant than the original, and both the dithering in the original printing and the texture of the cover show up more in the scan than they do on the book itself. It’s a bit of a shame, because the green glowing lime Jell-o pudding really leaps out at you. 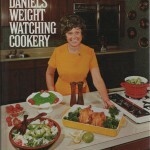 Adelaide Daniels was founder of the Weight Watchers of Ontario, but doesn’t seem to have left much of a biography on the net. The book itself is for sale from some “antique” book-sellers, listing USD 7.95 — maybe I should keep it and wait for it to appreciate more? Not responsible for resulting queasyness, here’s a recipe for my Jamaican friends. Jamaican Orange: Fill a 6-ounce goblet 2/3 full of an orange-flavoured, low-calorie carbonated beverage. Add rum extract to taste, and ice to fill the glass. arnish with a lemon twist. Makes 1 serving.